The strengthening of global economy is having a great impact on the worldwide market for hard luxury goods. The increasing preferences for front-line and sophisticated products among consumers has fueled the sales of hard luxury goods across the world. Over the forthcoming years, the increasing number of high net-worth individuals in developed countries and the rising disposable income of consumers in emerging nations are likely to reflect positively on this market. The overall opportunity in the global hard luxury goods market is expected to rise to a whopping sum of US$75.24 bn by 2017. Further, the market is predicted to report a high-paced progression at a CAGR of 10.90% between 2017 and 2022, reaching a massive value of US$126.11 bn by the end of 2022. The worldwide market for hard luxury goods is broadly assessed on the basis of the type of the product, sales channel, and the gender of the consumer. Based on the type of the product, the market is segmented into watches and jewelries. Watches are the more prominent revenue contributors among the two. With the segment’s revenue rising at a CAGR of 8.30% between 2017 and 2022, watches are likely to remain the most valued product in the worldwide hard luxury goods market. However, jewelries are also expected to witness a steady increase in their demand over the forthcoming years. On the basis of the gender, the market is classified into men and women. Women are supposed to be a more lucrative buyer segment for hard luxury goods in comparison to men. Researchers expect this scenario to remain like this over the next few years. By the sales channel, the market is categorized into monobrand stores, specialty stores, department stores, and online stores. Monobrand stores and specialty stores are reporting a higher sales of hard luxury goods than the other two segments and this trend is likely to continue in the years to come. Latin America, North America, the Middle East and Africa (MEA), Europe, Asia Pacific (APEJ), and Japan are the prime regional markets for hard luxury goods across the world. Among these, Europe has surfaced as the leading regional market for hard luxury goods, thanks to the presence of key hard luxury goods brands in European countries, such as Germany, France, Switzerland, and Italy. Analysts expect the Europe market for hard luxury goods to retain its position over the next few years with the rising count of duty-free stores. The extremely dense retail network in this region will also boost the Europe market for luxury goods in the near future. Among others, the APEJ market for hard luxury goods is anticipated to experience a steady rise over the coming years due to the increasing number of newly listed high net-worth individuals and the augmenting disposable income of consumers in this region. This regional market is anticipated to gain 129 BPS in its market share by the end of 2022. 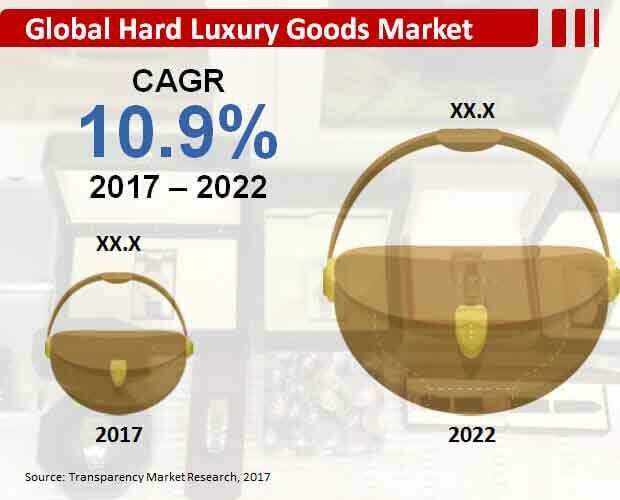 The increasing number of players in the global market for hard luxury goods market is anticipated to intensify the competition within the market over the next few years. Currently, Graff Diamonds Ltd., LVMH, Giorgio Armani, Swatch Group, Richemont, Bulgari, Chanel S.A., Ralph Lauren Corp., Tiffany & Co., and Harry Wintson are leading the market for hard luxury goods across the world. Of late the global market for hard luxury goods has been gaining noticeable impetus. With the rising presence of branded products among consumers, fueled by the significant increase in their disposable income, this market is likely to continue witnessing strong growth over the next few years. This report by Transparency Market Research (TMR) attempts to present a comprehensive analysis of the global hard luxury goods market by examining the prominent trends, growth drivers, limitations, and opportunities and the impact of these factors on the demand for hard luxury goods between 2017 and 2022. It also examines the potential of this market at the global as well as the regional level. Further, a detailed analysis of the value chain, which offers an exhaustive overview of the worldwide market for hard luxury goods has been offered in this research study, encompassing the market attractiveness analysis, in which, the end users are benchmarked on the basis of their market size, rate of growth, and general attractiveness. The research study provides a comprehensive assessment of various important factors that influence the sales of hard luxury goods across the world to readers for wise decision making. It also offers a thorough evaluation of the lucrative opportunities, which involve untapped or recently explored factors that are expected to drive this market over the forthcoming years. Further, it carries out an analysis of the value chain to help in understanding the market at length. This value chain assessment includes a detailed evaluation of the roles of numerous important entities in the global hard luxury goods market, from the raw materials suppliers to the end users. Various procedures of the production of hard luxury goods have also been examined in the value chain analysis. Furthermore, the market attractiveness analysis has been carried out to evaluate the end-use segments, which are projected to be lucrative and profitable over the forecast period, taking a number of factors, such as the size of its market, its profitability, growth rate, and the degree of the competition, in consideration. Largely, the global market for hard luxury goods is analyzed on the basis of the type of product, sales channel, and the gender of the consumer. Based on the type of product, the market is classified into watches and jewelries. By sales channel, the market is categorized into monobrand store, department store, specialty store, and online store. Based on the gender of the consumer, the report bifurcate the market into men and women. In terms of the geography, the research study broadly classifies the global hard luxury goods market into North America, Europe, Latin America, Asia Pacific excluding Japan (APEJ), the Middle East and Africa (MEA), and Japan. These geographical categories are, then, evaluated on the basis of the current and imminent trends in each of the regions in order to provide an insight into the current and expected demand for hard luxury goods there. The demand from the individual end-use sections in each of the regional markets has also been presented in this research report. Furthermore, the report estimate the market size of each of the regional hard luxury goods market in 2017 and make predictions for the coming years. The figures related to the regional markets have been estimated on the basis of their performance, in terms of the product-, distribution channel-, and gender-based segments. Graff Diamonds Ltd., LVMH, Giorgio Armani, Swatch Group, Richemont, Bulgari, Chanel S.A., Ralph Lauren Corp., Tiffany & Co., and Harry Wintson are the key companies functional in the global market for hard luxury goods.